Many of you probably have noticed that the Sunday night/Monday morning email/post is generally one from “The Pastor’s Corner”, but today is an odd exception. Thursday when I received the piece from Pastor Danny for Sunday/Monday I made a goof; I clicked “send” instead of “save draft”. It was probably a millisecond before I realized what I had done and thought immediately “Oh, if I could only unclick or unsend that!”‘. Well, obviously I couldn’t and most of you got the Pastor’s Corner well ahead of its rightly published time. As I thought on what I’d done, it occurred to me that what comes out of our mouths, what we say, is often the same way; once it’s spoken it can’t be unsaid, or as a famous lawyer, I believe, once said, “that bell can’t be unrung”. James 3:7, 8 says “For every kind of beast and bird, of reptile and sea creature, can be tamed and has been tamed by mankind, but no human being can tame the tongue. It is a restless evil, full of deadly poison. ” Words often seem to roll out of our mouths, through our lips without any thought or control. 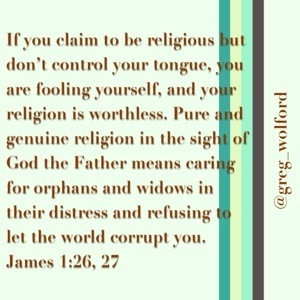 And I believe this is what God’s Word is teaching and warning us about: bells that can’t be unrung. I know that the Word of God is the sharpest thing that has ever and ever will exist. But man’s words can cut pretty deeply, just not nearly as cleanly, precisely, or to any real good.